When Lisa Himmelman founded SkateABLE – Canada’s only high-quality adaptive ice skating program for children with physical and developmental disabilities – in 2013, she knew the program would be a hit with parents and children, but what she needed to ensure its success was a team of committed and passionate volunteers. Unsurprisingly, students from Wilfrid Laurier University heard the call and have joined the cause year after year. “The great thing about the program is that everyone is there because they want to be — volunteer coaches and children are always really excited to see each other,” says fourth-year Biology and Psychology student Shannyn Seaward. Seaward is among a cohort of Laurier students volunteering as coaches at SkateABLE. Their involvement is through Laurier’s Community Service-Learning (CSL) courses, an experiential learning program that integrates service in the community with academic content. “I’ve always loved to skate and I have a lot of experience working with children who have disabilities, so I thought it was a great opportunity to get involved,” says Seaward. "It’s really rewarding — we empower these kids to learn at their own pace, and I get to understand what teaching techniques and approaches kids respond to." SkateABLE started after Himmelman saw the need for such a program while coaching figure skating across Canada and running her own skating academy. She developed SkateABLE so that all children could learn and enjoy ice-skating in a welcoming, caring, and stimulating environment. The program began almost five years ago with only 13 children, and has grown to filling all of its openings with close to 40 children each session. In a typical skating program, there are about 10 children per coach. Himmelman posted volunteer opportunities through Laurier’s volunteer webpage and was approached CSL staff, who connected SkateABLE with courses and departments at the university that could provide volunteers. SkateABLE has also attended Laurier’s Community Volunteer and Engagement Fair, where the organization has been able to recruit students outside of CSL courses. 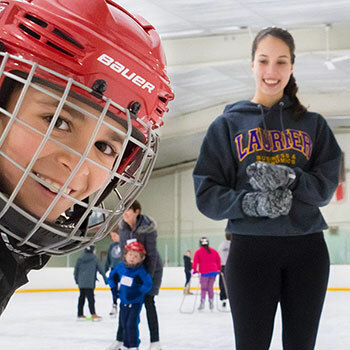 Since those early days, all Laurier students enrolled in CSL courses now have the option to spend close to 10 weeks volunteering with the skating program. Anyone from the Laurier community — including students, faculty and alumni — with skating experience and an interest in community engagement can also volunteer with SkateABLE. Himmelman and her staff provide training at Laurier twice a year — once in each of the fall and winter terms. “We can give students a unique experience through hands on involvement working with children who have disabilities, and at the same time we get the volunteers we need to be able to offer our program,” says Himmelman. A CSL placement with SkateABLE was ideal for Kameron Evoy. The third-year Laurier Psychology student has been skating since he was four years old, and also has experience working at hockey camps. Himmelman stresses the influence that Laurier’s volunteers have on the children in SkateABLE. SkateABLE has had several Laurier students continue their involvement with the program after they finished their CSL placement. The program runs once a week in Waterloo and has recently expanded to Toronto, using the partnership with Laurier as a model.